Africa has been the source of many of the world’s most coveted crafts, the site of remarkable feats of architecture, and home of rich music. No matter how much you know about the traditions and products of this vast, multi-cultural continent, Africans Thought of It: Amazing Adventures will reveal something new. Written for children nine to thirteen, the book will doubtless educate their parents as well, leading to family conversation and further reading. “People in Africa discovered how to make pottery around 7,000 BC,” the book informs, and African women still make serviceable pots from clay and decorate them with vegetable dyes. Basket weaving is a fine art in Africa. Coffee, hair-braiding, and hieroglyphics all originated in Africa. Africans built esthetically pleasing small homes, as well as massive stone fortresses like the Great Zimbabwe and the Egyptian pyramids. Africans have also long been expert at herbal healing: “Leaves from the aloe vera plant were ground into a powder that was used as a medicine to treat wounds,” a practice that persists today. Western alternative medicine draws on the ancient lore of African herbalists, adopting remarkable innovations such as the use of snake venom to inoculate people against snake bites. Traditional African healers still practice their craft, curing ailments that baffle Western doctors. “Training to become a healer took a long time,” we are told, and the ability often ran in families. The book features two helpful maps of the African continent and color photographs illustrate each section. For example, the weapons segment includes pictures of everything from arrows (said to have been first used in Africa), to the formidable “hunga munga,” a metal and wooden axe with a curved blade and a balanced short handle that could be hurled “to make it spin as it flew through the air toward an enemy.” This same implement was also used for farming and construction. The authors of Africans Thought of It: Amazing Adventures bring complementary interests to their work: Bathsheba Opini, a Kenyan, teaches African Studies programs at the University of Toronto; Anthropology Professor Emeritus Richard B. Lee found his life’s work when he lived among the San people of Botswana. 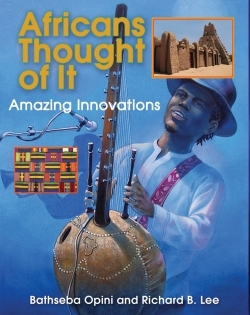 Africans Thought of It: Amazing Adventures is one of a series; after your children read it, they may want to delve into similar offerings about Inuit, Chinese and Native American peoples.